As we all know, I don't do perfect. 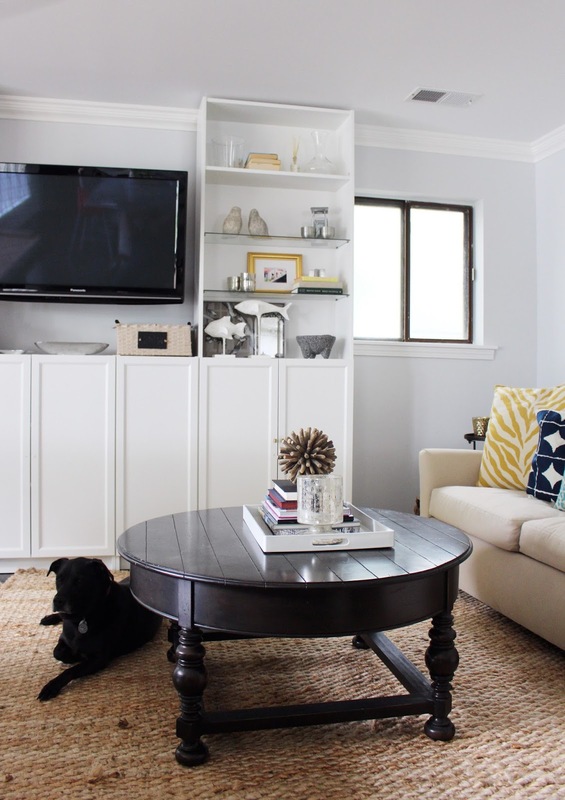 There is no point in faking it for the blog because, quite frankly, ain't nobody got time for that, so it's time for an honest look at a less than perfect Reno Reveal. A Reveal-ish if you will. No super glam photos, no perfect styling, no fresh blooms, just my real life Living Room that I cannot manhandle into looking presentable for the life of me. Yes, we do have a giant pool table in our living room, thank you for noticing! This space is our battleground. 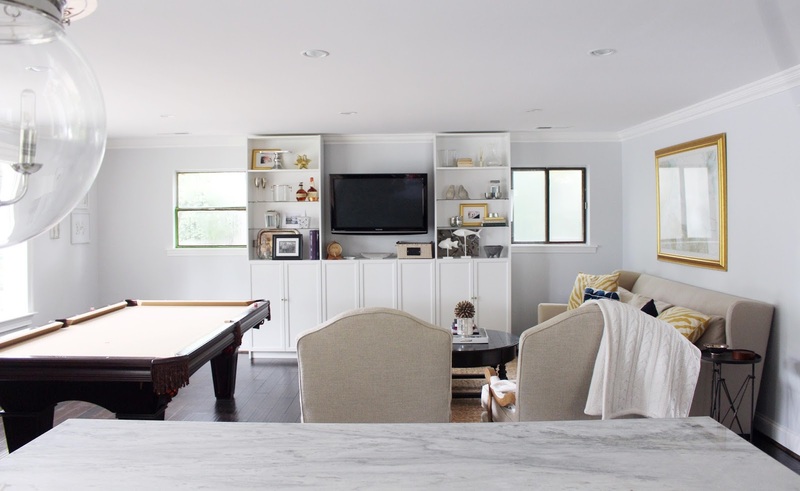 From the moment we started designing, scheming and planning for this house, my husband insisted that his pool table have a home in our open concept living room. And not just space for the pool table, but actual, legit, regulation space around the table for playing. I'll admit that even when we were planning, and despite having the pool table in our first house, I didn't realize just how much space the pool table area would demand in the room. 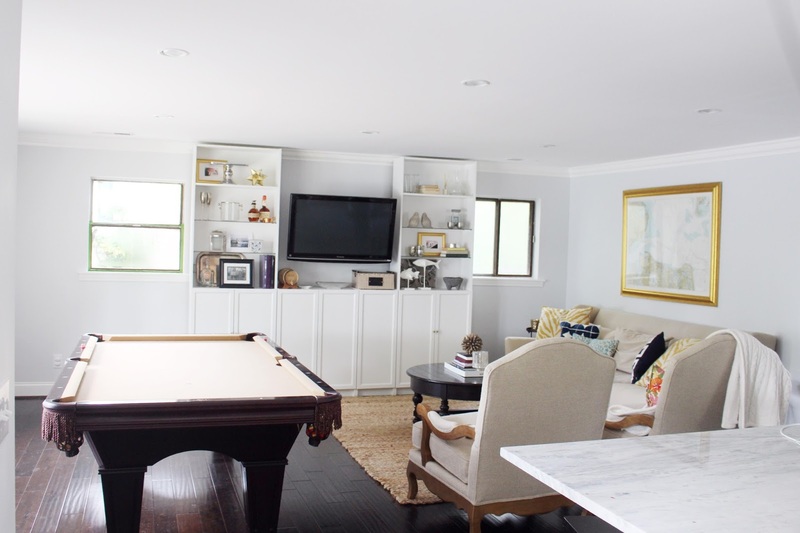 I know it sounds desperate but I think I blocked out the actual dimensions of that thing - and for the record, in our first house Justin actually had a closet removed and turned the combo living/dining room into a Man Room built specifically for his pool table. Obviously, that decision was made before I came into the picture. In the spirit of marital bliss, I will throw my husband a bone and admit that he was nice enough to have the table re-felted from the traditional AstroTurf green to a gorgeous shade of camel. But, despite the upgrade and stylish gesture, I still struggle with blending his idea of the room's purpose with my idea of the room's style function. 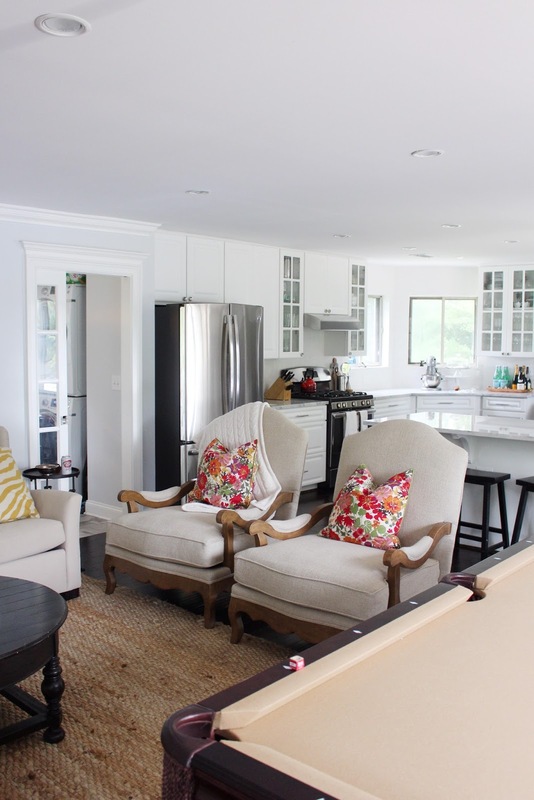 If the pool table saga wasn't enough, the Living Room is also home to our one and only DIY project in this entire house (we had it rebuilt from scratch, it was best to leave it to the pros). 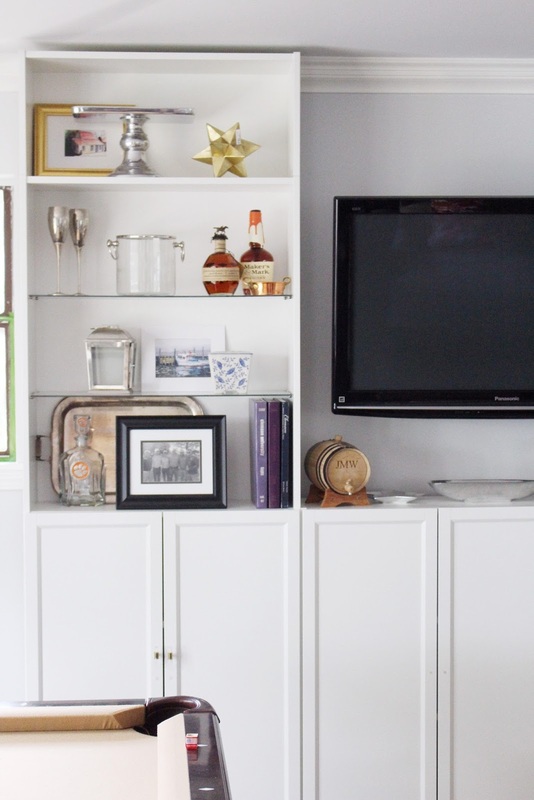 We took a quick (too quick) peek at Pinterest and just knew we could become IKEA Billy bookcase hackers. We built our Billy Bookcase unit, complete with upgraded shelving, doors and extender kit, with plans to trim it in ourselves for the "built in" look. Pinterest swears that it's super easy to do. We're waiting on our carpenter to come back and do the work. It may never be done. And because I know the shelves are still under construction, I refuse to really put any effort into styling them. So they just hold all of the things that won't fit elsewhere. Giant decanter? Shelves! Bourbon bottles? Shelves, of course! Random photos? Where else? The shelves! Aside from the wall of IKEA nightmares, the other new addition(s!) 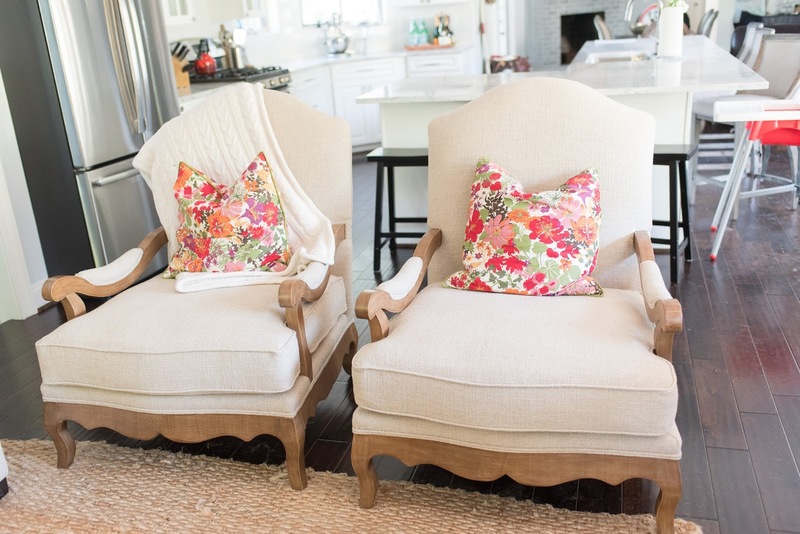 to the room are the two gorgeous oatmeal Jonathan Louis Brennan Wood Accent Chairs. And, I am obsessed with them. No shame in my game. Initially, the plan was for our old leather club chair to hold court in the transitional space between the kitchen and living room but one chair just looked odd, and odd is, um, not the decor theme I was hoping for. Thankfully, the design gods smiled upon me and the crew at Jonathan Louis Furniture came to me with a plan: less odd, more chair. If I'm being honest, I'll admit that the loss of the leather chair was another his and hers/marriage/style/compromise issue. Thankfully, there came a time when even Justin could see that the sad solo chair just wasn't doing the space any favors. Despite doubling the amount of chairage (I just made that up, go with it) in the room, the pair somehow manages to balance the (yet to be completed) shelving unit and while adding to the open feeling of the space. And, I don't want to be the wife who rubs things in, but I just have to say that the new Brennan Chairs are so, so much more comfortable than what we were rocking before. The super high quality seats are deep and cushy, perfect for drinking tons of wine with friends and tough enough to handle a wild babe for a little Disney Jr. viewing. 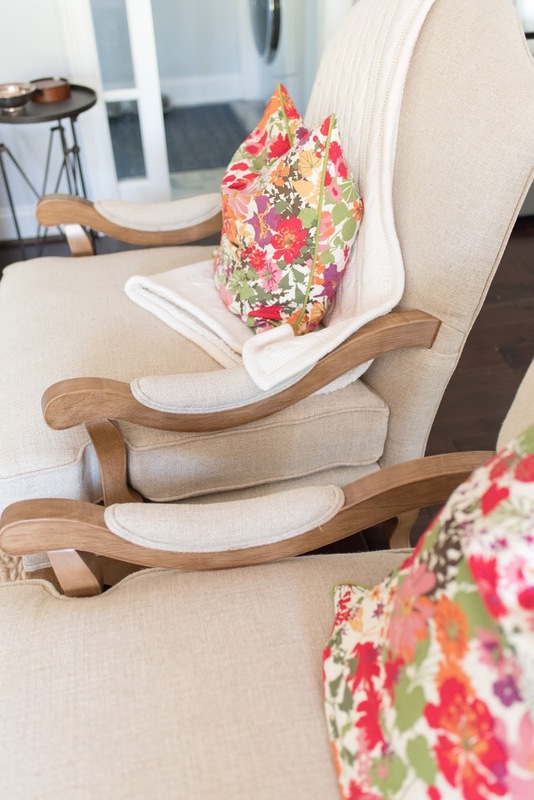 I chose a fabric and shade that was soft and neutral, mostly because we move so much and I need our key pieces to fit into any space, but I must say, I spent a moment or two lusting after the (literally) hundreds of fabrics and color choices available (my chairs are in Protege Natural). Go ahead on over to the Jonathan Louis main site to ogle and order swatches and find a retailer so you can Goldilocks your way through their selection of gorge furnishings. One last thing: does anyone notice anything peculiar about the windows? Ah, the life of a renovation novice is just so glam! So there you have it, an honest look at one of our unfinished, as yet to be blended, less than styled spaces. I'd hate for anyone to walk around thinking that I had it all together! I'm seriously swooning. When can I move you? Surely you need a live-in nanny?